If The Trailer Is Rockin’ … Stabilize it! Billy Joe Shaver said it the best, if the trailer is rockin’ don’t come knockin’. But a rocking trailer is for most of us a huge inconvenience. As soon as somebody starts moving, the trailer will too, and it’s one of those things you think have to accept when you’re in a home on wheels. Fortunately, there are several ways and products nowadays that will help stabilize your camper. Some are made especially for fifth wheels, while most work fine with any camper, RV or travel trailer. Most campers come with very functional stabilizer jacks, but they don’t take care of all the motion since they’re pretty small compared to how big a trailer frame is, and they’re not connected to the RV tires in any way which is where some of the motion comes from. Today we’re going to talk about several ways to stabilize and limit the wobbling, rocking, shaking, bouncing motion that might be driving you crazy. Whatever you choose to call it, we’ve decided to categorize the products as easy and advanced. Anybody can do the easy solutions in a couple of seconds, where the advanced ways require a little bit more time and setup. The first easy way to stabilize your camper is by making sure that the wheels can’t move. You might think that wheel chocks will help with that and while it can reduce the rocking, the tires will still be relatively free to move. That’s where the popular X-Chocks come into play. These are sold in pair and come with a wrench tool that you use to install them between your tires. 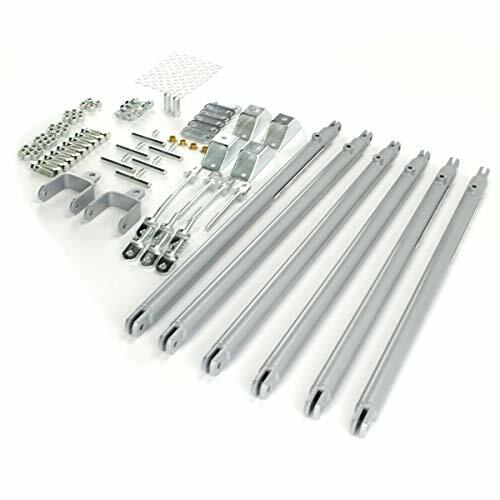 X-chocks retract from 1 3/8 inches and extends up to 12 inches so they will work with most RVs, fifth wheels, and travel trailers. So how do they work? When you arrive at your camp and have unhitched and leveled your RV, you put the X-chocks between the tires and tighten them just enough to where they’re in place. What it will do is stop the tires from moving when the trailer rocks from people walking around. Note that since you have to install these between tires, they only work with tandem axles and not single axle trailers. The X-Chock Wheel Stabilizer are a great starter when it comes to stabilizing. They’re very portable, weighing only 11.2 pounds. Easy to install for anybody that have knees good enough to set them up between the tires. A rust inhibitive coating will protect them from the weather, and a handle make them easy to carry and set up. Remember not to set these up before you have unhitched and leveled your camper. Another thing that makes the trailer rock is when somebody enters it using the RV steps. We’ve earlier looked at the best RV steps that are easy to install and that reach to the ground which instantly makes it more stable. If that’s not something you’re interested in at the moment, the Camco step support will at least improve your current steps. The way it works is that once you’ve folded down the steps at your campsite, this is put underneath it and can be adjusted from 8.5 to 14 inches depending on how high your steps are. Putting two of these on the bottom step will stop your trailer from rocking as much when somebody enters the RV. What we like about the Sav-A-Step is the fact that it’s not something you have to install and remove every time you set up camp. They’re installed as a permanent solution that screws in and folds up into the step during travel. This makes it an effortless and accessible way to stabilize your RV. 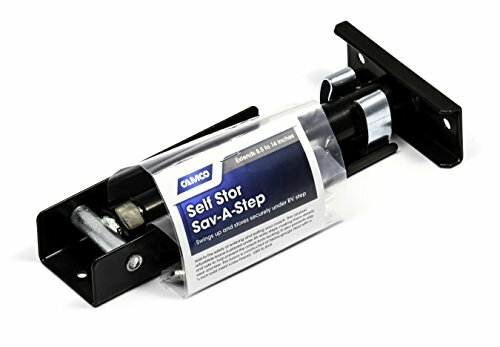 Combine the Camco Self-Stor Step Support with the X-Chock Wheel Stabilizer, and you’ll be able to tell the difference when entering and walking around in your camper. If you have a fifth wheel, this is the first thing you should consider purchasing. It’s called a 5th wheel stabilizer tripod jack and is designed to stabilize especially the front of your fifth wheel trailer. To set it up, you unfold it and set it up by the kingpin on your RV. 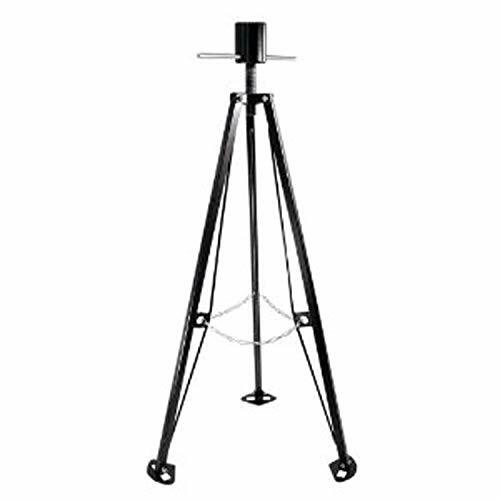 It’s designed to be adjustable in height, from 38.5 to 50 inches high. 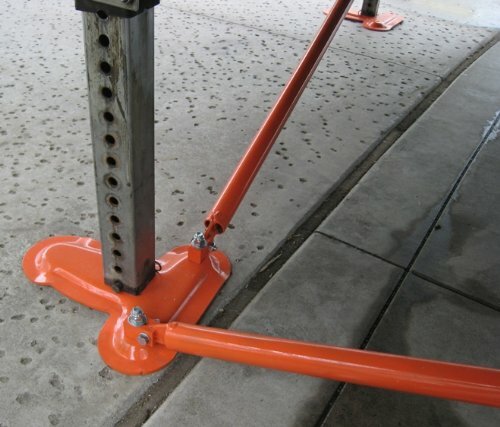 This popular model made by Eaz Lift supports up to 5000 lbs, so it’s a heavy duty stand that will stabilize your fifth wheel with very little work. Weighing 27 pounds, and measuring 49 by 7 by 7 inches, it’s a heavy but solid choice for fifth wheel owners looking to stabilize their big and heavy RVs. We’ve now looked at a couple of easy ways to stabilize your RV with certain products and designs. Now, let’s get to some more advanced solutions that require more setup and work. Of course, if you don’t want to install one of these advanced solutions yourself, you can reach out to a nearby RV shop and have them help you out. The first advanced solution we’re looking at might not look very advanced to most of you, and it isn’t. I decided to put this here instead of the easy way since you have to get down on your knees and use a ratchet strap. Valterra has made what they call the RV stabilizer model 020106. It’s a universal product made for all kinds of RVs, like 5th wheels, class C motor homes, toy haulers, travel trailers and utility trailers. It’s a portable product that stores in an included bag during transport and is then set up underneath the frame. It can be set up either on the rear bumper or along the frame. Valterra recommends installing one near the RV steps to stop the wobbling that occurs when somebody enters or leaves the camper. It has three bars, one on top and one on each side of the top bar. 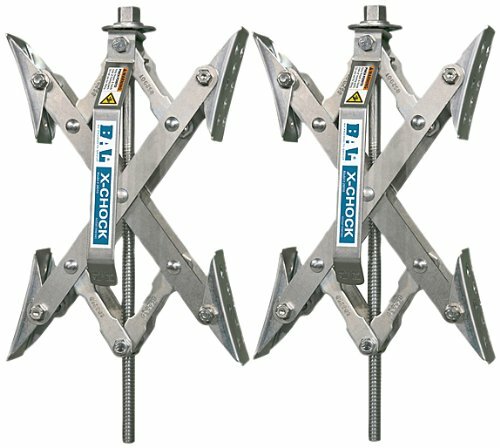 Then it has two feet that are connected to the sidebars. Then a ratchet strap is attached between the two feet and tightened. Depending on how high your trailer is, you can adjust the sidebars from 14 to 28 inches. 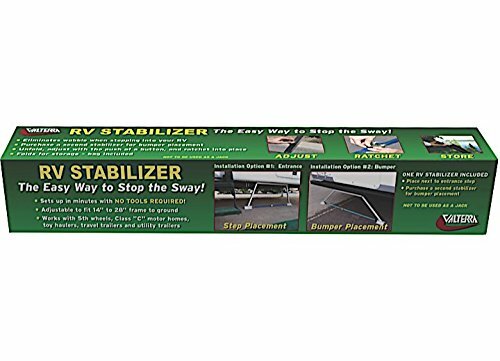 The Valterra 020106 RV Stabilizer is a popular way to go because it works and it prevents wobbling when people walk around or it’s windy outside. My wife and I have considered these as we’ve seen friends use them which have seen considerable improvements in terms of wobbling and rocking. All in all, an excellent solution that is easy enough to set up as long as you’re comfortable to get down on your knees. For trailers longer than 30 feet I recommend using two of these. One kit weighs 3 pounds. Take it one step further than with the Valterra RV Stabilizer and you get the Lippert stabilizer kit. The first thing to note is that there are different versions available depending on what kind of trailer you have. The Lippert 191023 JT’s Strong Arm Fifth-Wheel Jack Stabilizer Kit is for fifth wheels, and other big trailers, while the Lippert 191025 JT’s Strong Arm Travel Trailer Stabilizer Kit is for travel trailers. Lippert JT’s stabilizers use race car suspension technology to eliminate all wobbling basically. By utilizing a triangulation design, it will instantly make your camper more stable. This is something that the stabilizer jacks can’t do on their own. The stabilizer kit is bolted and installed permanently onto your RV stabilizer jacks and will telescope into place when you set up camp. All you have to do each time is tighten the bars. Lippert 191023 JT’s Strong Arm Fifth-Wheel Jack Stabilizer Kit is a reliable solution that works. It’s a more advanced solution that requires more time and skill to install compared to the easier alternatives above, but it’s also better at eliminating chassis movement. It’s a heavy duty system that works. If you don’t think that you can install it on your own, you should contact a nearby RV shop and ask for help. The last stabilizer system we’ll take a look at and recommend is the SteadyFast system. It looks and works a lot like the Lippert system above, but works slightly different. This system works with all camping trailers that have four jacks. Two front and two rear. The reason is that these are installed on the jacks. Since they’re installed permanently it doesn’t require any set up when you arrive at the campsite, all you have to do is engage the system to lock the bars. So what makes it different from the Lippert system? The SteadyFast creates bigger triangles with its triangulation design. The SteadyFast system goes from one side to the other on the front and back of the trailer, while the Lippert system goes to the middle of the front and the rear from each side. Is it better than the Lippert system? In our opinion, yes. Note that if you have a big trailer with a power leveling system, a different model exists for you. Click here to see that specific model. The SteadyFast RV Stabilizer System for 5th Wheels and Camper Trailers is in our opinion the best way to eliminate chassis movement on any fifth wheel or travel trailer. When installed, it requires even less of a set up than the easy solutions. It does take some time and skill to install, but it will be worth it in the end to have a stable camper. I hope you have found some inspiration and learned about how to stabilize your camper. Stabilizing your RV will not only make it more convenient but can increase the value if you decide to sell it with some gear attached used for this purpose. Let us know in the comments down below what you have done to stabilize your RV, or if you have any questions.